Irvine, Calif. – R.D. Olson Construction, an award-winning general contracting firm in California, commenced ground-up construction on a waterfront dual-brand hotel by Marriott in Marina del Rey, California. 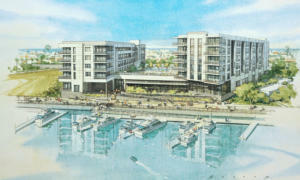 Located on Via Marina and Tahiti Way near world-famous beaches, seaside dining and waterfront activities, the hotel will include a Courtyard and Residence Inn by Marriott overlooking the harbor. The 2-acre property will feature two podium-type buildings with 288 guest rooms in total and is close to Venice Beach, Redondo Beach Pier, Los Angeles International Airport and major freeways. The Courtyard by Marriott, a five-story, 159-room building situated on the south side of the project site, will be designed for business travelers. Features and amenities will include free Wi-Fi, in-room desks and flexible work and meeting spaces. The 129-room, six-story Residence Inn, situated on the north side of the project site, will cater to extended-stay guests. Hotel offerings will include several room options, including large one-bedroom suites and penthouses. All rooms will feature a spacious living room, in-suite work space, wraparound decks that overlook the marina and a fully equipped kitchen to allow guests to feel comfortable and at home during their stay. The Courtyard and Residence Inn will share a lobby, waterfront restaurant and bar and a second-level outdoor terrace showcasing an expansive view of the marina with a pool, cabanas and fireplace. The property will also include a separate fitness building, more than 72,000-square-feet of subterranean parking and 28-foot-wide pedestrian promenade along the water with a new public dock service. The dual-brand Marriott hotel will boast a contemporary, coastal-inspired style designed by Redondo Beach interior design firm, KHI Interior Design. R.D. Olson Construction is also working with Awbrey Cook Rogers & McGill Architects + Interiors, DCI Engineers and Fuscoe Engineering on the project. Completion is anticipated for summer 2019. The Marriott in Marina del Rey bolsters R.D. Olson Construction’s portfolio of dual-brand projects, which includes several new dual-brand properties that are expected to start construction this year. Most recently, the company completed H Hotel, a dual-brand hotel adjacent to Los Angeles International Airport.